Hannah Cheriyan was born with her umbilical cord wrapped around her neck. Close to asphyxiation, she was airlifted to U-M’s C.S. Mott Children’s Hospital and placed on an Extracorporeal Membrane Oxygenation, or ECMO, machine, where she remained for days. Almost 22 years later, Cheriyan is now a first-year medical student and fellow in the U-M Medical Scientist Training Program, and she has even worked in the very lab that saved her life. 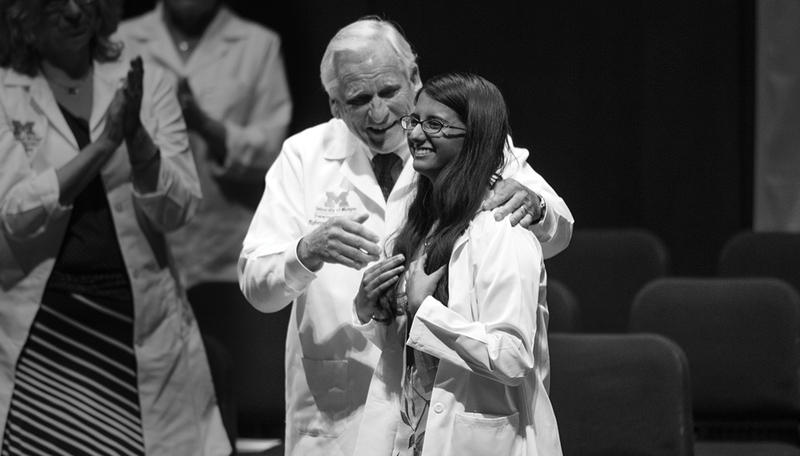 At the 2015 White Coat Ceremony, she was cloaked by Robert Bartlett (M.D. 1963), professor emeritus of surgery, credited with developing ECMO.